Bats figure strongly in the lore of Halloween, gothic novels, and horror movies. But a flight of bats bursting from the belfry is more a part of our literary heritage than representative of where most bats live. Their image as bloodsuckers is an exaggeration of the behaviour of a few species of bats found only in South and Central America. Fascinated by this, Bram Stoker included vampire bats in his classic nineteenth century novel “Dracula”, which set the tone for an entire genre. Of the nearly 1000 species of bats that occur worldwide, only eight species visit Mount Revelstoke and Glacier National Parks in summer and none of them feed on blood. Typically, a bat in the Columbia Mountains is less than ten centimetres long and light enough to be mailed as a first class letter. The risk of rabies from them is minimal. Bats are the only mammals that fly— able to prey upon flying insects that are active at night by bouncing high frequency sound waves off them. Part of the sound wave is reflected back toward the bat, which interprets these sounds with their large ears to locate prey. 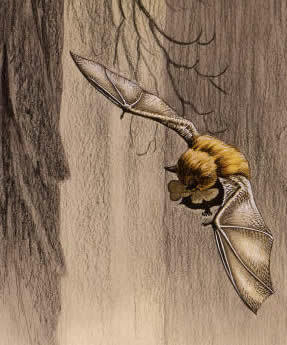 Using their wings as a scoop, a single bat can capture thousands of mosquitoes each night. Most of the bats here during the summer live in areas of old growth forest, requiring standing dead trees with cavities, cracks, or peeling bark for a place to roost during the day. A bat can squeeze through a crevice as small as five millimetres. A good roost provides protection from sun, rain, temperature extremes, and predators. In her research at the Giant Cedars Trail and other nearby locations, Carolina Caceres of the Canadian Wildlife Service found that the northern long-eared bat only roosted in large old trees. Reproductive females were especially picky about roost sites, requiring a place where infant bats could cluster together for warmth while their mothers were out feeding. During flight, a bat’s heart rate can reach up to 1300 beats per minute. With such a high metabolic rate, a bat needs to eat one-third to one-half of its body weight each night it hunts. Sleeping during the warm part of the day saves the energy that would have been used for keeping warm at night. This strategy also takes advantage of the availability of nocturnal insects that evolved to avoid insect-eating birds (most birds are daytime hunters). Bats are but one of the many seldom observed facets of nature we take for granted. They’re a part of a natural system upon which the forest relies to control outbreaks of destructive pests such as hemlock loopers, a kind of moth. From a hemlock tree’s perspective, it’s these moths that play the part of blood-sucking vampires. In some years, by their sheer numbers, the hemlock loopers can kill hemlock trees by completely stripping them bare of leaves. As for bats at Halloween, the only ones you will see are the decorative type. The real bats went south at the first sign of cooler weather in late August to maximize their intake of insects. They need to have 25% of their body weight as fat before entering hibernation. Bats accomplish this long fast though strict energy and water conservation, roosting in caves or abandoned mines that remain above freezing temperature all winter and that have high humidity to protect bats from dehydration.